OpenTumblr Goes QT, [Desktop Tumblr App] - OMG! Ubuntu! 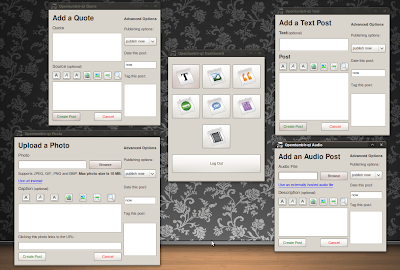 OpenTumblr is a desktop application for posting and uploading files, photos, etc, to your Tumbr account. I’ve blogged about OpenTumblr before [see here and here] but the latest release slipped out the door a few weeks back without my noticing! Belated news, but news nonetheless; here’s what’s new in OpenTumblr 0.2.0. The QT-ing of OpenTumblr has resulted in most of OpenTumblr getting a visual shakedown. Whilst many windows need some usability-guidelines applied, everything works as it should. You will then find OpenTumblr QT in your internet submenu.